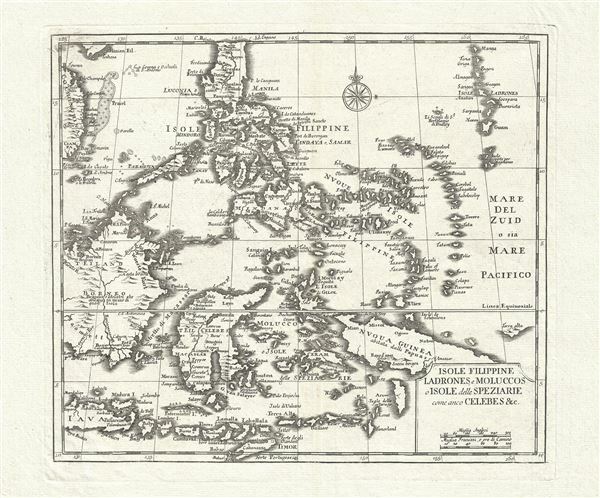 Isole Filippine Ladrones e Moluccos o Isole delle Speziarie comme anco Celebes & c.
An attractive 1740 map of the southern part of the Philippines or Philippine Islands. Centered on Mindano, the map covers from modern day Vietnam (Cochinchina) to the Ladrones, and from northern Luzon to the island of Timor. It includes parts of Borneo, the Celebes, New Guinea, Java, and the Moluccas. There is impressive detail throughout, including numerous inland cities and topography illustrated in profile. This map was drown for the Giambattista Albrizzi Italian edition of Guillaume De L'Isle's Atalante novissimo che contiene tutte le parti del Mondo. The maps in this edition are all attributed to Isaak Tirion, who probably laid them out, but they were engraved by Albrizzi, with Italian text and styling. Tirion himself did not release these maps on his own accord until the publication of his own atlas in 1744. Salmon, T., Lo Stato Presente (Albrizzi), 1740. Very good. Original plate mark visible. Slight centerfold wear. Blank on verso.